One of the greatest thrills from doing family history research is that occasionally what goes around, comes around. Over the last few years I have been corresponding with a cousin of my wife’s, Paddy Nolan, on a shared part of our family tree concerning the Giles and Nolan families of Carrick-on-Suir, Co. Tipperary, Ireland. I’ve been sending finds at this end to Paddy, he’s been reciprocating with finds at his end, and together we have achieved a lot in unravelling the shared part of our respective family stories. In 2014 there was a further development. Following the recent passing of their brother, Midge (Eugene), Paddy Nolan and his brother Pierce (top photo), who still resides in Carrick, had been in conversation about the family history research being compiled, and during their conversation came across the above photo. 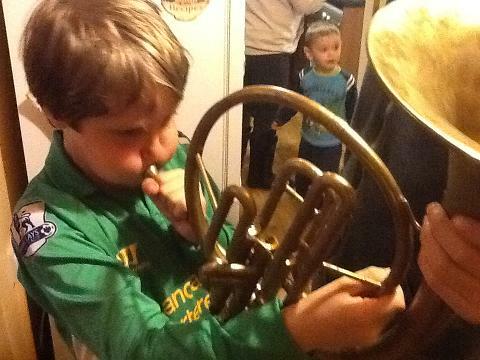 It transpired that Pierce had in his possession the very same French horn that Paddy Giles once played in his youth. 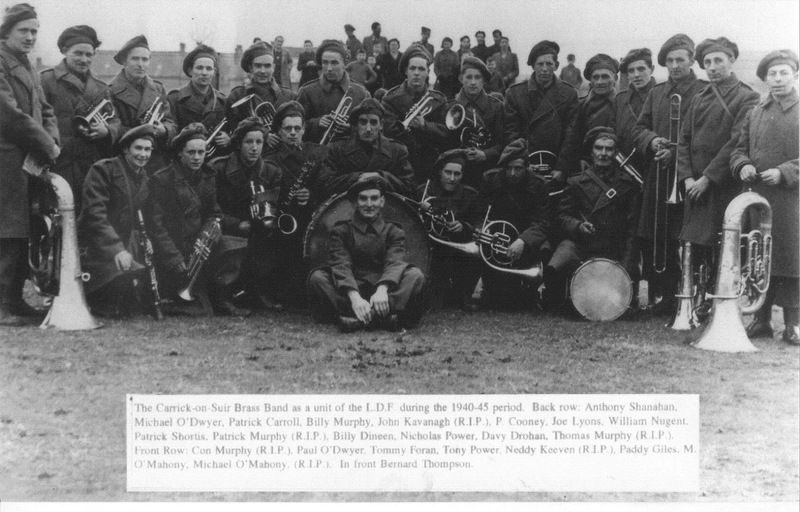 Paddy Giles was in the LDF and the band for a couple of years, but when he left (after the war, to join the RAF), the French horn was duly passed to Pierce as Paddy’s successor. Pierce continued to play with the band for just under a year, before he too eventually left. 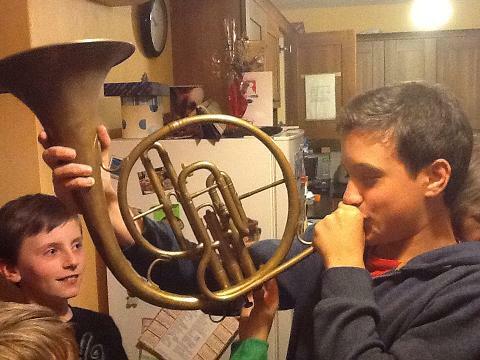 At that point the French horn left Pierce’s possession, and that was seemingly that – until a happy venture at a recent local auction in the town saw Pierce purchasing the instrument once again. During their discussion, Pierce had indicated that he would like to give my wife the instrument that her father once owned and played – if ever we were in the Carrick area, we could pop in to pick it up. Needless to say we were absolutely delighted! On a return visit to Carrick-on-Suir a few months later we arranged to meet up with Pierce. We had a wonderful conversation with him about Carrick in the past, the role his grandfather had in establishing the brass band in the first place, and confirmed that Paddy Giles’ father was also involved with the band in earlier years, though to what extent we have still to establish. I asked Pierce how he knew that the French horn purchased at auction was the same one? 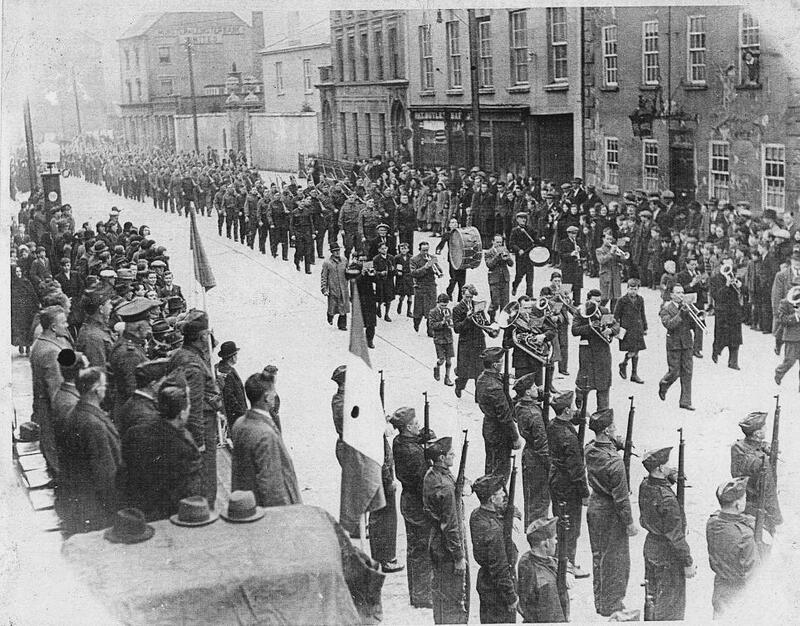 The answer was simple – the instrument was partially damaged one day when Paddy Giles dropped it on the Main Street! The dent that it left was of a unique shape, and it was this that Pierce recognised instantly at the auction. Later in the evening, Claire and I returned home, after thanking Pierce for his generous gift. In the house of Paddy’s widow, my mother-in-law Pauline Giles, several of Paddy’s grandchildren were present, including my sons Calum and Jamie. An instrument is for playing, and so we allowed them each to try to get a note from it! The French horn is now very tarnished, and we will seek advice now on whether it should be cleaned and restored, or left as is, before doing anything further with it. But the experience was absolutely extraordinary, and one for whom we are forever indebted to Pierce Nolan, and to his brother Paddy. Family history does not get much better than this.